You've probably gotten a bee sting at some point in your life, but have you ever gotten a bee sting on your testicles? Well, one Cornell grad did, and it sent him off on a journey to find out once and for all the worst places on your body to get stung by a bee. And he was going to test the whole thing out on... himself. 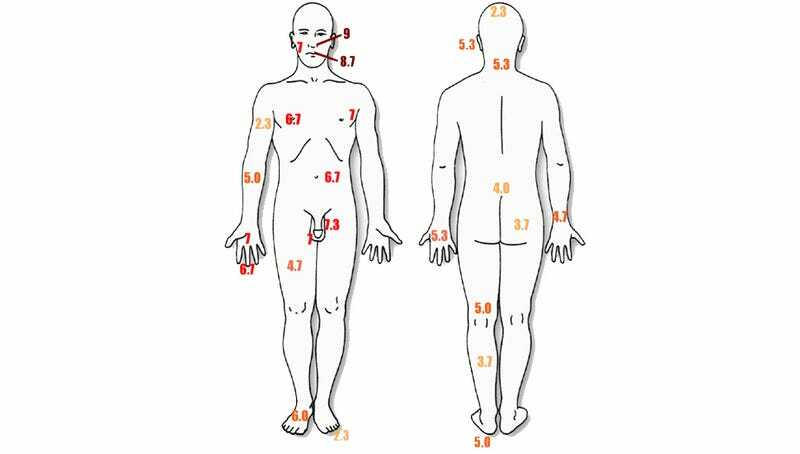 Using the Schmidt Sting Pain Index, (a scale made by entomologist Justin Schmidt to quantify pain caused by insect stings), Michael Smith went out with a pair of forceps to grab bees by their wings and press the angry insects against his various body parts. The stinger would then be allowed to sit in the offending area for exactly one minute before being removed, at which point Smith would rate his pain on a scale of one to 10. While pain is obviously fairly subjective and, thus, difficult to quantify, Smith was as systematic in his method as humanly possible. Each day he would subject himself to no more than five stings, all of which took place between the hours of 9 and 10am. And to account for any potential "off" days, Smith even stung himself on the forearm before and after each round of bee encounters as a way of calibrating the results. Meaning that for 38 straight days, Smith stung himself on 25 separate body parts, three times each. Smith explains that "some locations [even] required the use of a mirror and an erect posture during stinging (e.g., buttocks)." Getting stung on the top of the skull was like having an egg smashed on your head. The pain is there, but then it goes away. It's electric and pulsating. Especially the nose. Your body really reacts. You're sneezing and wheezing and snot is just dribbling out. Getting stung in the nose is a whole-body experience. Of course, this doesn't mean that these are definitively the most painful body parts on which to get stung—he is just one man after all. Smith was also forced to avoid testing certain areas for the sake of not going blind (i.e. eyeballs). Of course, if you're really that curious, you can always sacrifice your own eyes to the bee gods. For science.